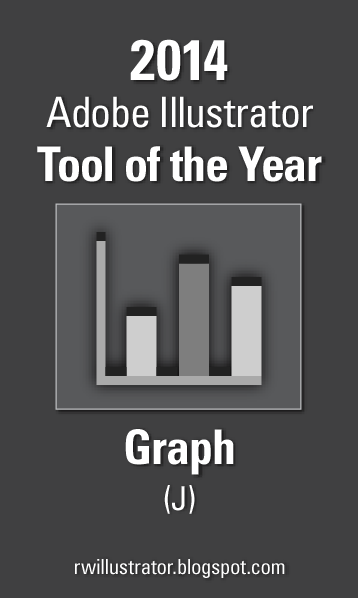 In a shocking turn of events, this year's Adobe Illustrator Tool of the Year prize was awarded to 9 tools. The Column Graph tool was chosen to officially represent the other winners, which include the Stacked Column Graph tool, the Bar Graph tool, the Stacked Bar Graph tool, the Line Graph tool, the Area Graph tool, the Scatter Graph tool, the Pie Graph tool, and the Radar Graph tool. The Width Tool (Shift-W), who fought through thick and thin and who was the popular favorite, was not available for comment. On a more serious note, today's designers live in a world filled with data. More often than not, the challenge is trying to discover what data NOT to include in a design, rather than figure out how to present data in the first place. We live in the age of the infographic. Not because they are trendy. Rather, they solve real problems. There is so much data out there, and designers have the ability to translate the right data into the right visuals to help people make the right decisions. While the Illustrator Graph tools are basic in nature, they offer a powerful way to translate data into visual form. The sheer fact that they only create basic grayscale shapes forces the designer to interpret the data, and to decide how to best present the story. It's not up to Illustrator's toolset to create trendy infographics. It's up to the designer to tell a powerful story that others can understand. 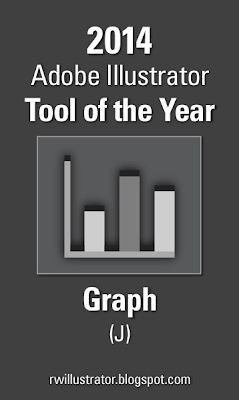 Don't get me wrong -- the Graph tools in Illustrator are in dire need of repair. They could be modernized and built to work far more efficiently. But even in their current state, they get the job done. And with the tremendous amounts of data that designers are going to be working with in 2014, the Graph tool will become a designer's best friend. Yes, the best tool in Illustrator! Fortunately, sites like http://raw.densitydesign.org/ start filling the gap.